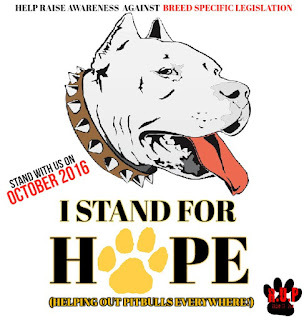 OCTOBER 2016 is PITBULL AWARENESS MONTH & WE HOPE YOU WILL RAISE UR PAW FOR HOPE! We at Raise Ur Paw, wanted to bring to the world a message of H.O.P.E (Helping Out Pitbulls Everywhere) in hopes that individuals around the globe will make the stand and become advocates for these innocent canines, and help bring to an end the BSL (Breed Specific Legislation). For way too long the Pitbull breed has not only been sentenced to a life of homelessness and killed due to their breed, but they have literally been labelled & targeted as "dangerous", due to fear and ignorance of humanity. We need the world to see that any dogs can become dangerous or a threat, if he/she feels threatened, abused or treated cruelly, or trained in manners which make them that way -- so really, any breed of dog can fall victim to the BSL, if we allow it! That is why we need H.O.P.E, a time of appreciation and education about the breed, to raise awareness and bring to public attention that change of perceptions and stereotypes are needed, and that we all need knowledge and foster positive attitudes towards these beloved canines.. and not discriminate against an entire breed, because would we discriminate against the whole entire human race, due to one or two humans inflicting injury upon another???? We need to unite and bring restoration to the image of the American Pit Bull Terrier, and stop BSL (Breed Specific Legislation ) from destroying more lives and families... for if Pitbulls are permitted to be a target, whose to say the breed of dog you have won't be next! So Let's Unite and Fight For H.O.P.E -- Tweet, Tag, Post and Share your images of you with your "fur-baby", and be part of the action: HashTag #RaiseUrPaw4Hope and let's make this world a world where no life is centered out.